Wenallt is a substantial house built in the 1900s as the manse for the chapel on the hill below. It retains many original features, including large rooms with their original fireplaces, but we can also offer you the essential modern comforts of well-appointed centrally heated and fully en-suite accommodation. Traditionally decorated, our rooms are spacious and furnished with comfortable seating, including sofas in the double and twin rooms. 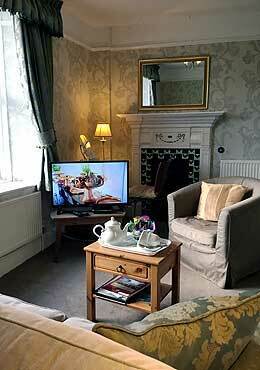 This makes us ideal for longer stays as well as short breaks. Guests are welcome to use their rooms during the daytime, or alternatively enjoy the views from the terrace. 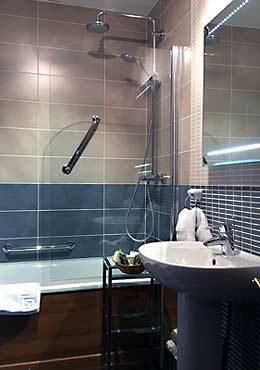 All rooms have tea and coffee making facilities, bottled water, digital FreeSat TVs, alarm clock-radio and hairdryer. Please note however that we can accommodate only up to a maximum of 6 persons at any one time. Regretfully we have no family rooms. 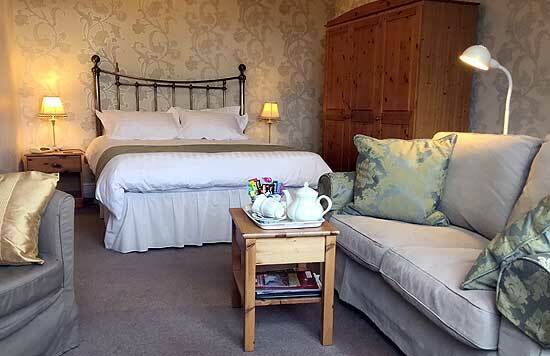 Unusually among B&Bs, we offer a single room, making us ideal for parties of three. If you are walking, cycling, golfing or touring the narrow gauge railways of the area, we can accommodate a party of up to 5 single persons, providing two of the party are happy to share the twin room. All guest bedrooms are situated on the first floor. If you have any concerns about accessibility please contact us to discuss your requirements.